A leader of Nigeria's oil militants has vowed to continue his struggle to keep more oil wealth in the Niger Delta, following his release from prison. Mujahid Dokubo-Asari was freed on bail on health grounds after being held on treason charges for almost two years. He told the BBC he was ready to talk to the government, as long as the army stopped using violence. His release has been a key demand of armed groups who have staged numerous attacks on oil installations. The move is seen as part of the new government's pledge to bring peace to the troubled Niger Delta region. Last week, three state governors from the Niger Delta appealed to new President Umaru Yar'Adua to free Mr Dokubo-Asari because of his ill health, while the Supreme Court refused a request to free him, citing national security fears. Justice Peter Olayiwola ordered that Mr Dokubo-Asari be freed on Thursday but the militant said he was not aware of the court proceedings until he was released. He was ordered not to engage in any political activity but he said that would be "impossible". 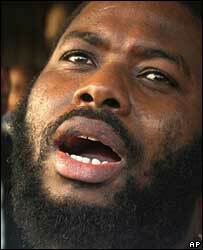 Mr Dokubo-Asari told the BBC's Network Africa programme that he was returning home to the Niger Delta on Saturday. "There is no way I can stop addressing my people," he said. He must also reports all his movements to the authorities. Leaders from Mr Dokubo-Asari's Ijaw community have welcomed his release. "This is good news for anyone with a business in the Niger Delta. It will pour cold water on the situation. Asari is key to bringing peace to the delta," said Emmanuel Diffa, an Ijaw elder who has been campaigning for him to be freed. In his inauguration speech last month, President Yar'Adua said that bringing peace to the region was one of his main priorities. He has already made preliminary contacts with the militants, who have declared a one-month truce and freed a large number of the foreign oil workers they had seized. Mr Dokubo-Asari was arrested in 2005 after saying in a newspaper interview that the Niger Delta, where most of Nigeria's oil is found, should secede. The militants argue that local people should benefit from more of Nigeria's oil. The attacks on hostage-taking in the Niger Delta have led to a 25% cut in Nigeria's oil production.